BLF keys built into the Telzio Dashboard and Telzio Mobile App. 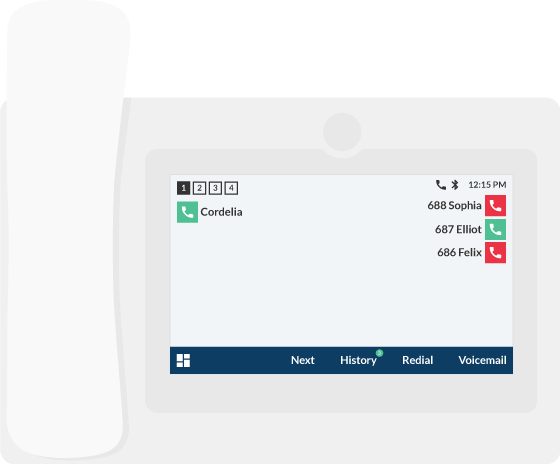 With Telzio there's no configuration required to view agent status across your phone lines. Presence indicators are available online and on your mobile device. Easily add BLF keys on your VoIP phones with the help of our experts. Busy Lamp Field (BLF) keys show you the current status, or Presence, of other employees, so you know who's on a call and who's available. Depending on the phone, you can have dozens of BLF keys to view the status of everyone in your organization. Enable front desk operators to see who's available or on a call. Add extension modules to view presence status for dozens of employees. Transfer calls to employees when they're available, or directly to their voicemail. Busy Lamp Field keys are useful for front desk operators, receptionists, and call center environments. With BLF keys, your staff can quickly identify who is available and who is currently on a call by glancing at their phone display. When an incoming call is received, the agent can then determine where to transfer the call, and whether to transfer the call to the employee's extension (if they're available) or directly to their voicemail (if they're on a call). What kind of device do I need to use BLF Keys? How do I configure BLF keys? Configuration of BLF keys will depend on the model of phone you have. You can find guides for supported IP phones on our support pages.